So this post is almost a year late, but given that it’s Thanksgiving in Canada tomorrow and once again turkey is on the menu, I figured well why not?! Brining the turkey for 24 hours is what gives the meat its lusciousness since turkey can be a pretty dry bird. I make a variation on Alton Brown’s turkey brine. I use 1/2 cup kosher and 1/2 cup lemon salt. I find the lemon salt (easily available in Scandinavian stores including IKEA!) creates a more tender bird. For the brine, mix the following ingredients and bring to a boil. Cool the brine down to room temp, fit the washed/clean bird into a large dutch over with a tight fitting lid, breast side down. Pour in the room-temperature brine, top up with cold/ice water until bird is submerged. Into the fridge it goes for 24-48 hours, turn it every 24 hours. For the flavored herb butter, blitz fresh or home-dried rosemary, thyme and oregano into a softened mix (I use my coffee grinder that I reserve specifically for herbs and spices). Mash that into 250g of softened salted butter with some pepper. This can be made a day or two ahead of time. 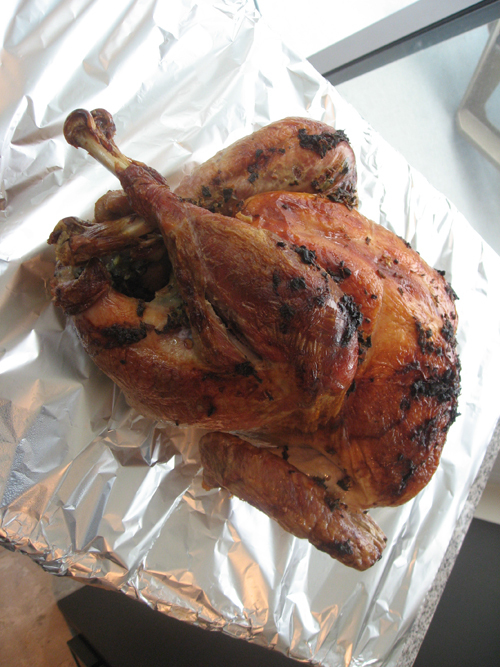 Preheat the oven to 500 degrees F. Remove the bird from brine and rinse inside and out with cold water. Discard the brine. Pat dry with paper towels. Using a teaspoon or your fingers, lift the turkey skin slowly and fill with the homemade herb butter until the entire bird (esp. breasts and legs) are well filled. Smear leftover butter and/or some olive oil on the bird. Tuck the wings underneath the bird. Baking big birds is a science. Use a prong thermometer and set for 165F – pierce it into the thickest part of the bird (breast or thigh – make sure NOT to touch the bone). Bake at 500F for 30 minutes, then reduce heat to 350F for another 2 hours or so, or until the bird reaches 165F internal temperature. If it starts to brown too much, cover the breasts with a foil tent.